The users of Samsung Galaxy S4 have been patiently waiting for the latest version of Android to come their way for a long time. 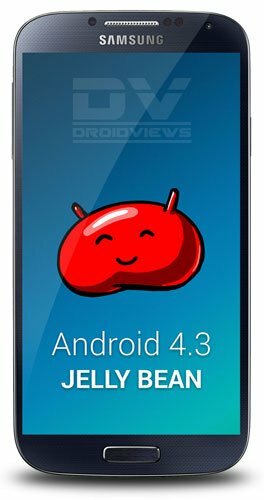 The rumors of Android 4.3 Jelly Bean update for the device, by the end of October, have finally started realizing and the leaked Android 4.3 test firmware for the Galaxy S4 can be taken as a solid confirmation. If you have any variant of the device, you’ll have to wait a little more to get the new taste of Jelly Bean. However, if you own the LTE version of the Galaxy S4 with model number GT-I9505, the treat has arrived for you in its raw form. Usually, Samsung takes a little longer time in sending the latest Android updates to its flagships, but this time it has taken just about 2 and half months. The available Android 4.3 firmware I9505XXUEMI8 is the leaked version of the official one and therefore it might or not be as stable in performance as an official release should be. We tested this firmware on our S4 and having used it for more than 40 hours, we can say that except for some Wi-Fi connectivity issues now and then, it is good as a whole. Keep in mind that it is a “test” and “taste” firmware both, so do not expect perfection! The Android 4.3 based I9505XXUEMI8 firmware is meant only for Samsung Galaxy S4 LTE GT-I9505. Do not dare try it even in dreams, if you have some other variant of the Galaxy S4. Install the firmware to your device at your own risk. We’ll not be responsible for any damage done to your phone. The firmware given below has OXA as CSC, and that means it is an unbranded firmware for Open Europe. It can be installed on any unbranded Galaxy S4 LTE GT-I9505 that is not locked to a carrier. If you have decided to try Android 4.3 leaked firmware on your phone, you’re welcome. But before you actually do it, there are few precautions to be taken and preparations to be made. Install Samsung USB Drivers Or Kies on your computer. If you have installed Kies, make sure it is not open while installing the firmware. Installing the new firmware might wipe your phone’s data. Backup the apps, contacts, messages and other data present on the internal SD of your phone. You can use These Apps To Backup Your Device easily. Charge your Galaxy S4 to 60% of battery level. If you have never used the newest version of Odin, that is ver. 3.0.9, here are the steps you need to follow to install the firmware. Boot your Galaxy S4 in Download Mode: press and hold Volume Up + Home + Powerkeys at the same time for 2-3 seconds and when you see the warning screen, pressVolume Up. Launch Odin3_v3.0.9.exe and connect your phone to PC via USB cable. When Odin detects your device, you’ll see light Blue signal on Odin and “Added! !” text in the message box. Make sure that only Auto Reboot and F Reset Time options are selected in Odin. Now click on BL button and select“BL_I9505XXUEMI8_1715731_REV06_user_low_ship_MULTI_CERT.tar”. Click the AP button and select“AP_I9505XXUEMI8_1715731_REV06_user_low_ship_MULTI_CERT.tar.md5″. Then click on CP and select“CP_I9505XXUEMI8_1715731_REV06_user_low_ship_MULTI_CERT.tar.md5″. Finally, click the Start button on Odin. Let the installation finish. When it completes, you will get PASS!! message with Green signal and our phone will reboot automatically. When the phone boots up, it will be running the newly installed Android 4.3 Jelly Beanfirmware. Congrats! In case of bootloop: pull the battery of the device, wait for a minute and put the battery back to its place. Now boot your phone into Recovery mode: press and hold Volume Up + Home + Powerbuttons together. Keep the keys pressed till the Samsung logo appears and disappears for 2 times. Now release the Power key while keeping other 2 keys pressed till you see a menu with blue text. When you are in Recovery mode, select the volume keys to scroll and power key to select options. Go to “wipe data/factory reset” option and select “yes”. Similarly, scroll to “wipe cache partition” and wipe it too.